Treme Brass Band at the Louis Armstrong Park in New Orleans. 2013. Photo by Robert H. Cataliotti. Courtesy of Robert H. Cataliotti. Today, Congo Square is part of Louis Armstrong Park in New Orleans. 2015. Throughout Louis Armstrong Park, a succession of sculptures recalls the ongoing legacy of those African people who gathered here. This is a sculpture of Buddy Bolden. 2015. Tootie Montana sculpture in Louis Armstrong Park in New Orleans. 2015. Congo Square in Louis Armstrong Park is marked by a series of embedded stone circles that pay homage to the drum circles that took place here two centuries ago. Street parade in Old Havana, Cuba. 2014. Conjunto Folklórico Nacional de Cuba in Havana. 2014. Jazz concert at La Zorra y El Cuervo Jazz Club in Havana, Cuba. 2014. Santeria drum exhibit at the Museum of the Slave Routes in Matanzas, Cuba. 2014. “Le Nègre Marron” (The Black Maroon or, in Creole, Neg Mawon) statue in Port-au-Prince, Haiti. 2013. An exhibit on Orishas, or African deities, at the Museum of the Slave Routes in Matanzas, Cuba. 2014. Drummers performing at Hotel Olaffson in Port-au-Prince, Haiti. 2014. Musicians on the road to the Citadel in Cap Haitien, Haiti. 2014. Stilt dancers in Old Havana, Cuba. 2014. Drummers at the Haitian Pavilion at the 2011 New Orleans Jazz Fest. Stilt dancers participating in the second line parade at the 2013 Satchmo SummerFest in New Orleans. Dr. Michael White performing at the Economy Hall Tent at the 2010 New Orleans Jazz Fest. Gospel singer performing at the 2011 New Orleans Jazz Fest. Treme Brass Band marching at the 2013 Satchmo SummerFest in New Orleans. A Social Aid and Pleasure Club at the 2011 New Orleans Jazz Fest. Mardi Gras Indians performing at the 2011 New Orleans Jazz Fest. Donald Harrison with Guardians of the Flame at Congo Square Stage at the 2010 New Orleans Jazz Fest. Mardi Gras Indians performing at the 2010 New Orleans Jazz Fest. A place called Congo Square. The song, written by guitarist Sonny Landreth, harmonica player Mel Melton, and bassist David Ranson, is a paean to the nineteenth-century Sunday gatherings of African people on a field at the back of the city that were a combination of music and dance, spiritual ritual, marketplace, socializing, and tourist attraction. Congo Square in New Orleans brought together people from a range of African nations. While some were brought directly from Africa, many came through Saint-Domingue/Haiti and Cuba. African people born in the Americas also joined in the mix, and the gatherings attracted both the enslaved and free people of color (gens de couleur libres). In addition, Native Americans and Caucasian people whose origins were in Europe and the United States were drawn to the festivities. Congo Square was unique because it was virtually the only locale in North America where African people were allowed to gather to perform their traditional music, especially their drumming. The music they made was founded on African-based, cultural retentions: call and response, improvisation, and rhythmic sophistication, and, eventually, these building blocks of expressive, black folk culture interacted with and absorbed elements of the cultures they encountered to create something distinctively American. In Africans in Colonial Louisiana, Gwendolyn Midlo Hall asserts that the African people who developed the Afro-Creole culture of New Orleans had a profound influence on the dominant Anglo culture of the United States. “They turned inhospitable swamplands into a refuge for the independent, the defiant, the creative ‘unimportant’ people who tore down barriers of language and culture among peoples throughout the world and continue to sing to them of joy and the triumph of the human spirit”.2 Congo Square was the epicenter of this culture and played an essential role in the Africanization of American culture. The polyrhythms, syncopation, and pulse beats that filled Congo Square are the heartbeat of the musical forms that emerged from New Orleans: ragtime, brass bands, jazz, Mardi Gras Indian chants, rhythm and blues, and funk. They also provide a link to the Afro-Caribbean diaspora, particularly Saint-Domingue/Haiti and Cuba, from which the slave trade brought Africans to New Orleans. From 1791 to 1804, plantation owners and enslaved Africans arrived from Saint-Domingue, fleeing the revolution that transformed the French colony into Haiti, the first independent black republic. Initially, the majority of these refugees fled to Oriente Province in eastern Cuba; by 1809 and 1810, however, these émigrés were expelled, and the vast majority of them sought refuge in New Orleans. Undoubtedly, during those Sunday gatherings these African people joined with those who had been in Louisiana carrying on the Congo Square tradition, intermingling their rhythmic variations, instruments, dances, and languages. The approaches to African spiritual belief systems—Voodoo that developed in New Orleans, Vodou from Saint-Domingue, and Santeria from Cuba—also likely came together there. Examples of this rhythmic heritage can be found throughout the Smithsonian Folkways catalog. One of the earliest compilations to explore Pan-African drumming is folklorist Harold Courlander’s two-LP set, African and Afro-American Drums (1954). Courlander states in his liner notes that the recording “demonstrates not only the diverse drumming styles to be found in various parts of Africa, but also the great impact that African percussion traditions have had on other parts of the world.” After surveying traditional drumming from Nigeria, Congo, South Africa, Madagascar, Equatorial Africa, and Rwanda on the first disc, Courlander presents examples of African-based drumming from the United States, the Caribbean, and South America, including “Haiti: Juba Dance Drumming,” “Cuba: Lucumi,” “The Virgin Islands: Bamboula Dance Drums,” and “The United States: Jazz Drumming” from Baby Dodds. Listening to these tracks, it is easy to imagine what it would have been like to wander from one drum circle to another on an antebellum Sunday evening in that square. The bamboula rhythm—an old dance referred to frequently in the early literature on the West Indies and survives in Haiti in name as the baboule—is particularly fitting because this was the signature rhythm with corresponding dance that was regularly performed in Congo Square, the antecedent to the second line parade rhythm that underpins the city’s distinctive jazz, rhythm and blues, and funk. Courlander’s inclusion of Dodds is also rather fitting. A master of the second line groove, he performed with the likes of Jelly Roll Morton, King Oliver, Louis Armstrong, and Sidney Bechet and was a foundational influence on what it meant to play jazz drums. Certainly, the recording makes it easy to draw a link between Africa, Haiti, Cuba, Congo Square, and the twentieth-century jazz tradition. That bamboula rhythm from Congo Square has also been linked to the music of Louis Moreau Gottschalk (1829–1869), America’s first world-renowned classical pianist and composer. He was born in the French Quarter to a Jewish British father and French mother, whose family emigrated from Saint-Domingue. Although the inspiration for Gottschalk’s compositions, such as “Bamboula” and “The Banjo,” has often been attributed to childhood visits to Congo Square, no documentation exists for any such visits, and it is more likely that he learned the Creole melodies and rhythms that inform these pieces from Sally, his family’s enslaved nurse from Saint-Domingue, who Gottschalk referred to as “La Négresse Congo.”9 Whether Gottschalk actually attended the Congo Square dances or not, his music is certainly emblematic of the crossroads that formed there. Born in New Orleans and reared in the culture of Saint-Domingue, he toured throughout the Caribbean and was particularly acclaimed in Cuba. Gottschalk was closely associated with the Cuban pianist and composer, Manuel Saumell Robredo (1818–1870), a master of the contradanza, widely popular dance compositions based on the African-derived habanera rhythm, a first cousin to the bamboula. It is likely that contradanzas composed by both Gottschalk and Saumell were an antecedent to the ragtime compositions of Scott Joplin and Jelly Roll Morton.10 The Smithsonian Folkways catalog features Gottschalk’s music, Louis Moreau Gottschalk: American Piano Music Played by Amiran Rigai (1992), and two collections of Creole songs that very likely reflect the music he learned as a youth from Sally: Creole Songs of Haiti (1954) by Haitian singer, dancer, and folklorist Emerante de Pradines and Street Cries and Creole Songs of New Orleans (1956) by Adelaide van Wey, a classically trained singer and folklorist. 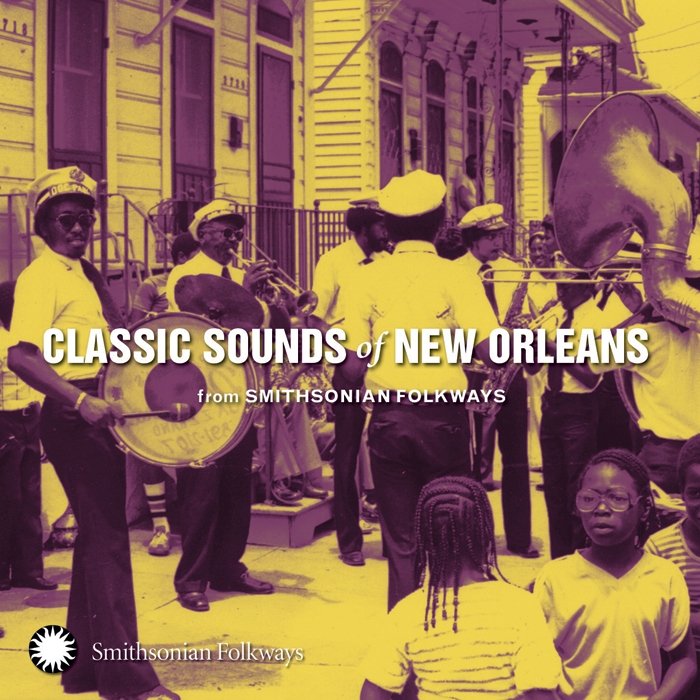 There are many recordings in the Smithsonian Folkways catalog that bear witness to the legacy of Congo Square embedded in the sounds of modern New Orleans music. During the 1950s, Samuel Charters produced the five-album series Music of New Orleans, a landmark collection that documents a wide range of the musical sounds of the city, including brass bands, dance hall jazz bands, solo piano, street musicians, and the first commercial recording of Mardi Gras Indians. You can hear that rhythmic sensibility in the guitar of Snooks Eaglin on New Orleans Street Singer (1958) and the piano of Champion Jack Dupree on The Women Blues of Champion Jack Dupree (1961). Of course, that rhythmic legacy is manifest in its most essential form in the drumming of Baby Dodds on Footnotes to Jazz, Vol. 1: Baby Dodds Talking and Drum Solos (1946). The rhythms that were hammered out in Congo Square are also the foundation of the brass band music on Doc Paulin’s Marching Band (1980) and the post-Hurricane Katrina variations of the Hot 8, Liberty, and Treme brass bands found on Dr. Michael White’s Through the Streets of the City (2015). Today, Congo Square is part of Louis Armstrong Park, marked by a series of embedded stone circles that pay homage to the drum circles that formed that crossroads two centuries ago. Throughout the park, a succession of sculptures recalls the ongoing legacy of those African people who gathered here: the drummers and dancers, the brass bands, gospel icon Mahalia Jackson, Mardi Gras Indian Chief Tootie Montana, jazz masters Buddy Bolden, Sidney Bechet, and, of course, the city’s greatest musical ambassador, Louis Armstrong. Congo Square is sacred ground. When the Neville Brothers sing, “some kind of something is going on down there,” they are declaring that what has happened in that place is beyond words. This is a crossroads that emanates an ineffable spirit and power, and Congo Square stands with our great landmarks in defining what it means to be American. Robert H. Cataliotti is an award-winning music critic and historian and teaches at Coppin State University in Baltimore. He has written two books: The Music in African American Fiction and The Songs Became the Stories: The Music in African American Fiction, 1970–2007. He is the producer and annotator of Classic Sounds of New Orleans from Smithsonian Folkways (2010) and several other albums. 2 Gwendolyn Midlo Hall, Africans in Colonial Louisiana (Baton Rouge: Louisiana State University Pressm 1992), 200. 3 Freddi Williams Evans, Congo Square: African Roots in New Orleans (Lafayette, LA: University of Louisiana at Lafayette, 2011), 7. 6 Benjamin Henry Latrobe, The Journal of Latrobe (New York: D. Appleton, 1905). 8 Jerah Johnson, Congo Square in New Orleans (New Orleans: Louisiana Landmarks Society, 1995), 47–48. 9 S. Starr Frederick, Bamboula! The Life and Times of Louis Moreau Gottschalk (New York: Oxford University Press, 1995), 30 and 42. Louis Armstrong sings “Boy From New Orleans” that will “tell you all about [his] life.” From the album Satchmo at the National Press Club: Red Beans and Rice-ly Yours (1972). Adelaide Van Wey sings Creole songs on Street Cries and Creole Songs of New Orleans (1956). Creole folk songs originated on the plantations of the French and Spanish colonists of Louisiana. The music characteristics embody African-derived syncopated rhythms, the Habanera accent of Spain, and the quadrilles of France. Photo courtesy of the Ralph Rinzler Folklife Archives and Collections. Celebrated gospel singer Mahalia Jackson continued the legacy of those African people who gathered at Congo Square. She talks about her childhood growing up in segregated New Orleans in I Sing Because I'm Happy (1995). Photo date: 1958. Photo by Robert C. Malone. Courtesy of the Ralph Rinzler Folklife Archives and Collections. Bilal Abdurahman investigates the roots of African-American music through poetry and music on Echoes of Timbuktu and Beyond in Congo Square, U.S.A. (1979). Pictured is his self-portrait in pencil drawing. 1973.